Bargello needlepoint belts are some of the easiest needlepoint projects to work. Quick to stitch, they make very versatile accessories. With a little planning and careful attention to detail, it’s quite simple to needlepoint a sassy or classy belt you can wear to look extra chic no matter the occasion or season. Before sorting through your thread stash or purchasing supplies, or even thinking about stitch techniques, you must take time to plan out the needlepoint belt project. This is not the time for short cuts or impulsiveness. Start off with this handy checklist to ensure a successful outcome and enjoyment as you work the project. A needlepoint belt can be as wide or as narrow as you want; however, if you want the finished belt to go through belt loops on most clothing, it should not be wider than 1.75 inches. Small Bargello designs with a single small repetitive motif are most effective for belts. With waist size in mind, make sure that the pattern is wide or thick enough (e.g. no more than 1.75 inches for a standard belt); and that it can easily be repeated across the length of the belt. 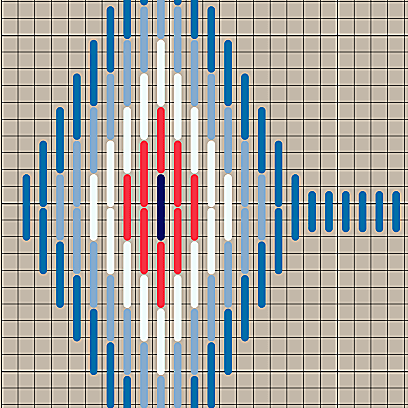 A Diamond Bargello Design was chosen for this stitch-along. The free needlepoint chart with detailed stitching instructions are included in Step 2-Stitching the Needlepoint Belt. Needlepoint belts worked in Bargello designs are quite lovely; but before you get carried away with the creative process and cut the needlepoint canvas, it’s best to choose the style of the finished belt first and then measure the amount of canvas that’s needed to complete the needlepoint design. Choosing a belt style is all about the type of closure or buckle you decide to use. With certain types of belt buckles, you can use a shorter length of needlepoint canvas. Since both the length and width of the completed needlepoint belt are determined by the closure, it is important to either first choose a belt buckle style or decide on a tie-style closure, and then design the needlepoint belt around it. Needlepoint belts work best with leather buckles that have tab closures, or decorative metal and plastic ones with two ends that clasp together in the center, or even tie-style closures with cords and tassels. Prong buckles that need eyelets can take away from the overall look and feel of a finished needlepoint belt; and depending on the thread you use, the finished needlework may be too thick for a slide-through buckle. Canvas selection is key to creating an eye-catching needlepoint belt that will make a fashion statement! The finer the canvas mesh the more detail you can work for the needlepoint belt. To make a belt that is .75 inches wide with a few detailed motifs, select #18-mesh mono needlepoint canvas. White or ecru colored needlepoint canvas works well for this project, but you can use other colors depending on your color selection for threads and fibers. For example, tan or black canvas would keep darker colored threads from showing through; while ecru or white canvas is preferable for lighter colored threads. A belt has to be durable and practical. Keep this in mind when choosing threads and fibers for working the needlepoint belt. While Persian wool works well for most belts, you can create a professional designer finish by experimenting with stranded and overdyed silk or cotton embroidery floss leftover from previous needlepoint projects. Limit the amount of metallic or specialty threads used in working the belt and do not use textured fibers as they may not be smooth enough for repeated stitching of the needlepoint pattern. Select as many colors as you like—especially those that match clothing and other accessories in your fashion wardrobe. Measuring the belt size is an important step in producing a quality needlepoint belt. Follow these steps for accurate measurements and to get the total width and length required for the needlepoint belt. Measure your waist over the type of clothing you normally wear with a belt. Allowing for a comfortable fit, record the measurement on a pad or sheet of paper. From this measurement, subtract the length of the belt buckle you've chosen; and then add 6 inches back (3 inches on each end) to the length to allow for room for finishing. Mark this length for cutting after you've determined the belt width. Measure the width of the belt based on the needlepoint pattern and belt buckle. Refer to standard belt sizes as outlined in the design section above. Add 4 inches to this measurement (2 inches on each side) and mark this width on the canvas. You’ll need this extra canvas to work border rows on the top and bottom that will be turned under during the finishing process. Check the needlepoint canvas edges on all sides and trim, if needed before measuring and marking belt size. In addition to the final belt measurements, add about 2 to 3 more inches on each end for attaching the canvas to a belt needlepoint frame. This will allow the canvas to turn around the belt frame roller bars at least 1.5 times on each end to make it taut enough for stitching. Prepare the needlepoint canvas by centering and marking an outline of the length and width of the belt with a waterproof fabric pen. Tape the edges all around the needlepoint canvas with masking tape.